Washington (CNN) – A group of Republican veterans are forming a super PAC to fund a new effort to refocus the party's messaging and policy goals, in an attempt to broaden the GOP's appeal beyond its traditional demographic base. "The goal is simple," said Alex Castellanos, who is spearheading the project, NewRepublican.org. 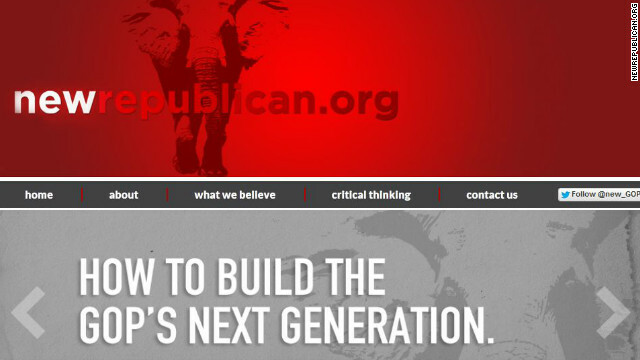 "Help move the GOP move forward and renew our brand." The endeavor is being backed by the likes of former Florida Gov. Jeb Bush, who is featured prominently on the web site. "If you think every parent should have the right to choose the best school for their kids, or believe we should grow our economy bottom-up, not top-down from Washington, you are thinking like a New Republican," Bush said. While federal law prevents the new super PAC from coordinating with candidates, Castellanos said he envisions it as serving as an information hub to help advance the Republican brand. "If you are a candidate we can't coordinate," said Castellanos, who is also CNN contributor. "But we are here to help Republicans with new ideas and new policies to help them lead the Republican Party forward and be more successful." Castellanos said the GOP doesn't need to "compromise" its principles, but must do a better job of communicating them. He compared this new GOP effort to the Democratic Leadership Council, a centrist organization that successfully moved its party to the center in the late 1990's on several policy fronts. "Our mission is to do for the Republican Party what the DLC did for the Democrats," Castellanos said. "The difference is the Democrats won the center with Republican principles on issues such as welfare reform, more cops on the streets, and 'It is the economy stupid.' Maybe we can win the middle, with Republican principles too." On its web site, the super PAC specifically highlights recent speeches Republican National Committee Chairman Reince Priebus and Louisiana Gov. Bobby Jindal delivered at the RNC Winter Meeting where both GOP leaders emphasized that the party needs to do a better job of communicating with voters. The Republican Party's base is shrinking. Their biggest problem are their indomitable beliefs that their views are the only views that people should follow. Variation of parameters and adaptability is not something conservatives are able to tolerate. The Republicans are going to collapse under the weight of their own homogenous thinking and instransigence. Most do not believe in evolution and it shows in their rigid mindset. This outreach is not one that allows the GOP to remake itself. No, it is one designed to reach out and transform others to the right wing's belief systems. Republicans aren't interested in building a 'next' generation. They are only interested in travelling back in time to the 1950s. It's awkward, sweaty 'rising star' Rubio merely parroted one of Romney's failed campaign speeches and offered little if any actual details. Want a better GOP? Abandon it. as the last message just commucated different then it wont work, changr the message. The Republican base is growing. The college students who were brainwashed by Obama the first time, are now unemployed and living in their parents' home with "fading posters of Obama" – as Paul Ryan said. Many of them didn't vote for him the second time around. It was the Hispanics that mostly gave him the winning votes. There's a whole new generation out there who are wising up. And to add to that, many have traveled the world now, and see how awesome their homeland really is. All this globalization Obama pushes might just backfire. Sinking ship. I'm curious to see what comes about from all this. And im actually kinda proud to have witnessed it in my lifetime. The country elected(and (re-elected) it's first black President and the Republican party imploded before our very eyes. They even tried to take the country down with them as they obstructed, mucked up, and sabotaged every single step to fix the mess they left after 8 years of wars and tax breaks for the rich. @RudyNYC you are absolutely correct. Of course, it's the message. But infalliable Republicans have convinced themselves that they are not being heard widely enough, or that people are just simply not listening because they are distracted by the star power of Obama. Jeb Bush made it illegal to feed the poor in Florida (to discourage homelessness), and he fought against a bottle deposit law because he said "it would just encourage homelessness! Great spokesman! Same old nastiness! What is a super PAC what the heck, these people is out of their minds, obama is the president an this so call super pac is not listening to obama. these are some stupid people. I see. So that explains why they turned out in record numbers and voted for Pres. Obama in 2012. The vast majority of those with higher degrees and most college students are liberals or regularly vote Democratis. Nothing has changed just because you say so. Your belief system is stronger than the facts. Most people are turned off by the extremism burning through the Republican Party. The mindset is the key issue that has been turning people off. Despite conservative claims to be constitution-lovers they are in fact anything but that. The Preamble defines the basic operations for the federal government. Liberals interpret the Preamble as defining the role of political leaders as that of caretakers who are to function within the framework outlined by the Constitution. Conservatives tend to take a more direct approach. They regard the Constitution as a set of rules by which to rule. There are significant differences between those two perspectives. castellanos is spearheading this? Well first of all this selection is a joke. I have watched this loser on CNN and he's not to bright. Seriously CNN keeps him on their network because he blurts out things that's way, way right wnged and that's where CNN is to the right. After the SOTO address they had all these boards and people judging the speech by dialing up or down,ENOUGH, ENOUGH. This crap is not reliable and instead of a roundtable discussion, CNN always try to make the speech results based on a group of people and those stupid boards and that fact checker guy who sounds like he just got out of bed. I never watched this channel I just flipped to it to see how much bashing they were doing to the President and how much praise they gave that stupid rubio, who by the way spent all his time bashing the President and taliking about what his party can do to better the country, pathetic. You are very foolish to take Paul Ryan's word for anything. There's a reason the people who know him best voted against him. Make-believe is no substitute for reality - there really are some dirty pots out there that need a hard scrubbing; Paul Ryan is only interested in scrubbing the clean ones, and only when the media is watching. The GOP needs to understand its okay to be conservative fiscally but what has them in trouble is their conservative views on social issues. The world we live is changing and they need to change with it or risk being the party of out power for a while. The GOP likes to say that we are all Americcans but I never see them reaching out to any ethnic groups until now with immigration. So if you want to play the game of politics then play to win and come up with a winning strategy that broadens your base.